(Hughes, 2000). However, recent investigations of planktonic foraminifera from sediment cores encompassing the last 1,400 years has revealed anomalous change in the community structure over the last few decades. The study suggests that ocean warming has already exceeded the range of natural variability (Field et al., 2006). A recent major ecosystem shift in the northern Bering Sea has been attributed to regional climate warming and trends in the Arctic Oscillation (Grebmeier et al., 2006). The progressive warming in the Southern Ocean has been associated with a decline in krill (Atkinson et al., 2004) and an associated decline in the population size of many seabirds and seals monitored on several breeding sites (Barbraud and Weimerskirch, 2001; Weimerskirch et al., 2003). Some initial observations suggest that changes to the ice habitat via the total thickness of sea ice and its progressively earlier seasonal breakup in the Arctic and Antarctic caused by regional climate warming has had a detrimental impact on marine mammal and seabird populations (Forcada et al., 2005, 2006; Stirling and Parkinson, 2006). Atlantic, including the benthos, fish, seabirds and whales (Drinkwater et al., 2003) and an increase in the incidence of marine diseases (Harvell et al., 1999). In the Benguela upwelling system in the South Atlantic, long-term trends in the abundance and community structure of coastal zooplankton have been related to large-scale climatic influences (Verheye et al., 1998). Recent macroscale research has shown that the increase in regional sea temperatures has triggered a major reorganisation in calanoid copepod species composition and biodiversity over the whole North Atlantic Basin (Figure 1.3) (Beaugrand et al., 2002a). During the last 40 years there has been a northerly movement of warmer-water plankton by 10° latitude in the North-East Atlantic and a similar retreat of colder-water plankton to the north. This geographical movement is much more pronounced than any documented terrestrial study, presumably due to advective movements accelerating these processes. In terms of the marine phenological response to climate warming, many plankton taxa have been found to be moving forward in their seasonal cycles (Edwards and Richardson, 2004). In some cases, a shift in seasonal cycles of over six weeks was detected, but more importantly the response to climate warming varied between different functional groups and trophic levels, leading to a mismatch in timing between different trophic levels (Edwards and Richardson, 2004). 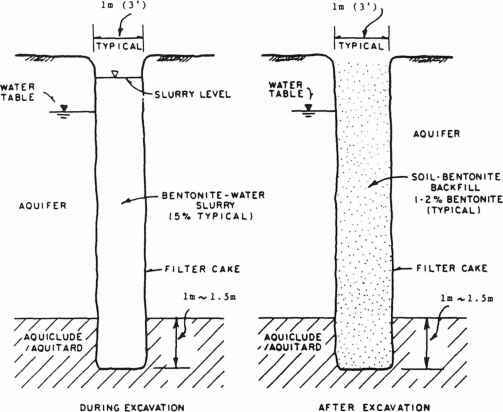 Figure 1.3. Long-term changes in the mean number of marine zooplankton species per association in the North Atlantic from 1960 to 1975 and from 1996 to 1999. 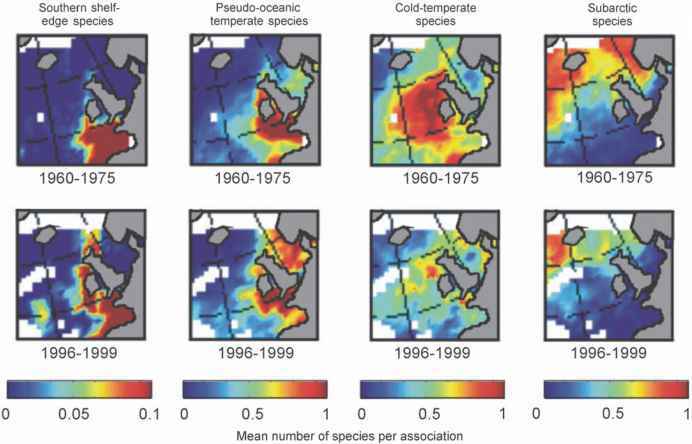 The number of temperate species has increased and the diversity of colder-temperate, sub-Arctic and Arctic species has decreased in the North Atlantic. The scale (0 to 1) indicates the proportion of biogeographical types of species in total assemblages of zooplankton. From Beaugrand et al., 2002b. Reprinted with permission from AAAS. Northerly geographical range extensions or changes in the geographical distribution of fish populations have recently been documented for European Continental shelf seas and along the European Continental shelf edge (Brander et al., 2003; Beare et al., 2004; Genner et al., 2004; Perry et al., 2005). These geographical movements have been related to regional climate warming and are predominantly associated with the northerly geographical movement of fish species (sardines, anchovies, red mullet and bass) with more southern biogeographical affinities. Northerly range extensions of pelagic fish species have also been reported for the Northern Bering Sea region related to regional climate warming (Grebmeier et al., 2006). New records have also been observed over the last decade for some Mediterranean and north-west African species on the south coast of Portugal (Brander et al., 2003). Cooling and freshening of the North-West Atlantic (e.g., in the sub-polar gyre, Labrador Sea and Labrador Current) over the last decade has had an opposite effect, with some groundfish species moving further south (Rose and O'Driscoll, 2002) in the same way as plankton (see 1.3.4.2). Regional climate warming in the North Sea has affected cod recruitment via changes at the base of the food web (Beaugrand et al., 2003). Key changes in the planktonic assemblage, significantly correlated with the warming of the North Sea over the last few decades, has resulted in a poor food environment for cod larvae, and hence an eventual decline in overall recruitment success. This is an example of how the dual pressures of over-fishing and regional climate warming have combined to negatively affect a commercially important fishery. Recent work on pelagic phenology in the North Sea has shown that plankton communities, including fish larvae, are very sensitive to regional climate warming, with the response varying between trophic levels and functional groups (Edwards and Richardson, 2004). The ability and speed with which fish and planktonic communities adapt to regional climate warming is not yet known. Observations indicate that lakes and rivers around the world are warming, with effects on thermal structure and lake chemistry that in turn affect abundance and productivity, community composition, phenology, distribution and migration (see Section 1.3.2.3) (Tables 1.3 and 1.6). In high-latitude or high-altitude lakes where reduced ice cover has led to a longer growing season and warmer temperatures, many lakes are showing increased algal abundance and productivity over the past century (Schindler et al., 1990; Hambright et al., 1994; Gajewski et al., 1997; Wolfe and Perren, 2001; Battarbee et al., 2002; Korhola et al., 2002; Karst-Riddoch et al., 2005). There have been similar increases in the abundance of zooplankton, correlated with warmer water temperatures and longer growing seasons (Adrian and Deneke, 1996; Straile and Adrian, 2000; Battarbee et al., 2002; Gerten and Adrian, 2002; Carvalho and Kirika, 2003; Winder and Schindler, 2004b; Hampton, 2005; Schindler et al., 2005). For upper trophic levels, rapid increases in water temperature after ice break-up have enhanced fish recruitment in oligotrophic lakes (Nyberg et al., 2001). In contrast to these lakes, some lakes, particularly deep tropical lakes, are experiencing reduced algal abundance and declines in productivity because stronger stratification reduces upwelling of the nutrient-rich deep water (Verburg et al., 2003; O'Reilly, 2007). Primary productivity in Lake Tanganyika may have decreased by up to 20% over the past 200 years (O'Reilly et al., 2003), and for the East African Rift Valley lakes, recent declines in fish abundance have been linked with climatic impacts on lake ecosystems (O'Reilly, 2007). Increases in the length of the ice-free growing season, greater stratification, and changes in relative nutrient availability have generated shifts in community composition. Of potential concern to human health is the increase in relative abundance of cyanobacteria, some of which can be toxic, in some freshwater ecosystems (Carmichael, 2001; Weyhenmeyer, 2001; Briand et al., 2004). Palaeolimnological records have shown widespread changes in phytoplankton species composition since the mid-to-late 1800s due to climate shifts, with increases in chrysophytes and planktonic diatom species and decreases in benthic species (Gajewski et al., 1997; Wolfe and Perren, 2001; Battarbee et al., 2002; Sorvari et al., 2002; Laing and Smol, 2003; Michelutti et al., 2003; Perren et al., 2003; Ruhland et al., 2003; Karst-Riddoch et al., 2005; Smol et al., 2005). These sedimentary records also indicated changes in zooplankton communities (Douglas et al., 1994; Battarbee et al., 2002; Korhola et al., 2002; Brooks and Birks, 2004; Smol et al., 2005). In relatively productive lakes, there was a shift towards more diverse periphytic diatom communities due to increased macrophyte growth (Karst-Riddoch et al., 2005). In lakes where nutrients are becoming limited due to increased stratification, phytoplankton composition shifted to relatively fewer diatoms, potentially reducing food quality for upper trophic levels (Adrian and Deneke, 1996; Verburg et al., 2003; O'Reilly, 2007). Warming has also produced northward shifts in the distribution of aquatic insects and fish in the UK (Hickling et al., 2006). With earlier ice break-up and warmer water temperatures, some species have responded to the earlier commencement of the growing season, often advancing development of spring algal blooms as well as clear-water phases. The spring algal bloom now occurs about 4 weeks earlier in several large lakes (Gerten and Adrian, 2000; Straile and Adrian, 2000; Weyhenmeyer, 2001; Winder and Schindler, 2004b). In many cases where the spring phytoplankton bloom has advanced, zooplankton have not responded similarly, and their populations are declining because their emergence no longer corresponds with high algal abundance (Gerten and Adrian, 2000; Winder and Schindler, 2004a). Zooplankton phenology has also been affected by climate (Gerten and Adrian, 2002; Winder and Schindler, 2004a) and phenological shifts have also been demonstrated for some wild and farmed fish species (Ahas, 1999; Elliott et al., 2000). Because not all organisms respond similarly, differences in the magnitude of phenological responses among species has affected food-web interactions (Winder and Schindler, 2004a). Table 1.6. Examples of changes in freshwater ecosystems due to climate warming.